91 Days follows Angelo Lagusa, a young man whose family was murdered in a mafia dispute, and his quest for “”revenge against the Vanetti Family, particularly its don, Vincent Vanetti. After seven years in hiding following the night of the murder, Angelo receives an anonymous letter from a friend of his father’s, prompting him to return to Lawless and exact his revenge. Under the name of Avilio Bruno, he begins to infiltrate the Vanetti Family by slowly befriending the don’s son, Nero. However, in this dramatic 91-day story, revenge breeds revenge, and killing may yield drastic consequences. How will Angelo Lagusa and Nero Vanetti fare, in this tragic harvest field that they have only begun to sow? You know what we’ve been missing? Some grit. I’ve been doing tons of easy going, slice of life, cutesy-wootsey stuff lately, and I wanted to talking about something gripping, something I have a stake in, something that leaves me unsettled. 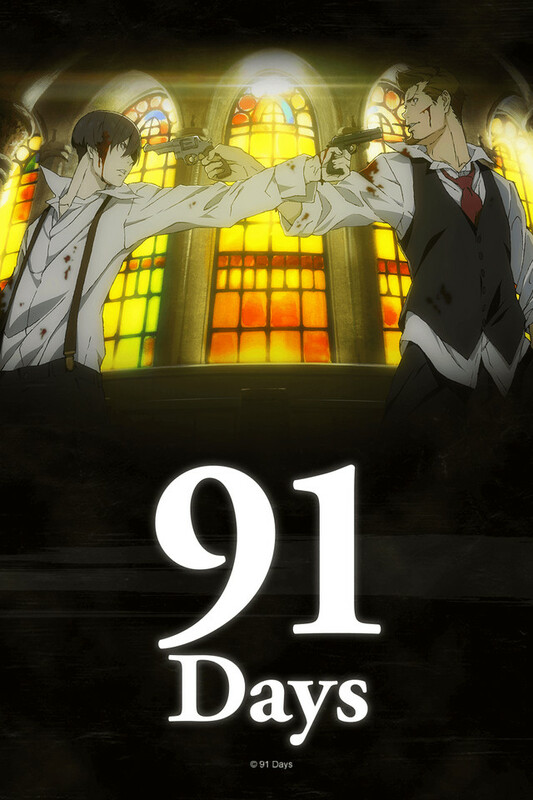 Enter: 91 Days, a seinen historical drama full of suspense and malignant churnings. I haven’t done a lot of historical reviews on here, so let’s start as usual with talking about our genre. It can be difficult to assess these if you’re unfamiliar with the context, but honestly, the show does a pretty good job of telling you what you need to know and no more. We’re set in an American town (city?) called Lawless– after further investigation, I’m thinking this is meant to be Lawless, Illinois– during Prohibition, where brewed liquor dominates the black market. Here, we’re dealing with a lot of warm, almost sepia-esque tones with a slight vignette. Colors in this series are muted which underscores the 1920’s feel without us really knowing why. It’s not as obvious as the cars characters drive, and that’s what makes it such a successful animation device. Well done, animators. 10/10! The plot is what you ask for, really: a revenge-seeking bloodhound bent on taking down the mafia from the inside. Great. The series also uses the “no one is safe; everyone dies” mentality like in season one of Attack on Titan. There’s something incredibly satisfying about the mood and tone this series creates with leaving the audience in suspense, and delivering with gore, violence and most of all, the characters’ mortality. I will say that I disagree with how the series ended. Is it really revenge if Angelo doesn’t end the three murders with his own hands? Is it really revenge if Nero lives? On the other hand, he does take down the mafia as a whole, as well as all of Nero’s family, and in turn, Nero is supposed to live with that pain. An agony which mirrors the one Angelo himself bore for years. Pacing is also questionable. While the characters are well-made, consistent and well-paced, the plot was severely skewed. We go a long time without a death of the other three murders. Most of the series, really. Two of them happen at nearly the same time and one, as I’ve mentioned early, never happens. The recap episode was unnecessary for such a short series as well. Overall, it’s a decent show. I enjoyed it, and recommend giving it a shot if you’re looking for something a bit grungy that’s well animated and set with a commitment to the historical genre!